CARSON CITY — Mike Pence had only released a text statement in the more than 48 hours since Donald Trump questioned the mother and father of fallen U.S. soldier Humayun Khan. He had avoided cameras and questions on Monday during his travels to Nevada after a weekend at home in Indianapolis. 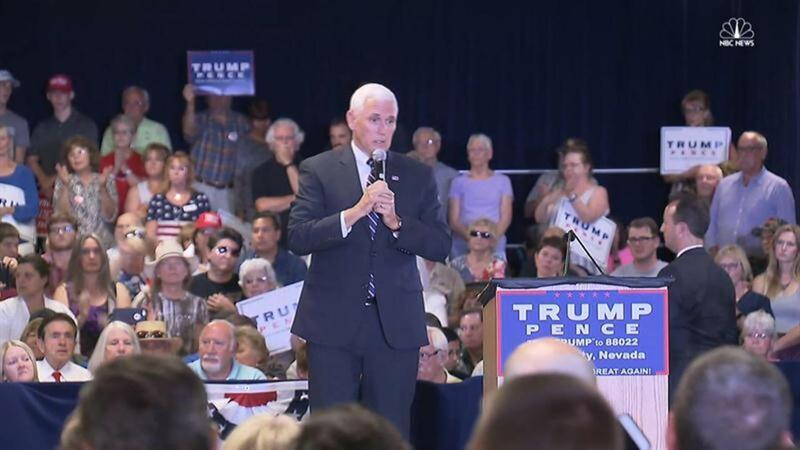 "Time and time again Trump has disrespected our nation's armed forces and veterans — and his disrespect for Mr. Khan and his family is just an example of that," Catherine Byrne, the mother of Raymond Harmon, who is currently deployed in the Persian Gulf, said to Pence. "Will there ever be a point in time when you're able to look Trump in the eye and tell him 'Enough is enough?' You have a son in the military. How do you tolerate his disrespect?" The crowd booed Byrne as she asked her question. Pence did attempt to quiet the jeers after she spoke, saying, "folks that's what freedom looks like and what freedom sounds like," to a smattering of applause. Captain Humayun Khan, died while serving his country in 2004. Byrne's son, 27, has served since high school — having previously deployed to Iraq in 2009 and 2010. He re-enlisted and is now on his second deployment on a base in the United Arab Emirates. "I felt disrespected," Byrne told NBC News after the event, regarding the crowd's overwhelming reaction to her. "And that was what my question was — disrespect toward the military. The crowd as a group booed me." Pence, from the stage just feet away from Byrne, continued in his response by saying "Let me just say first I want to honor your son's service to the country and your family's service to the country, I truly do." The Indiana governor went on to say that Captain Kahn is an "American hero and we honor him and honor his family." He then went on to claim that Trump supports veterans "like no other leader in my lifetime." "The only other thing I would say to you is having spent time with our nominee, I have never been around someone more devoted to the armed forces of this country, more devoted to the families of our soldiers, sailors, airmen, marine and coast guard and no one more devoted to the veterans in this country," Pence said without any real evidence for such hyperbole. "Donald Trump supports our soldiers and supporters our veterans like no other leader in my lifetime." After the event as Byrne left the venue, a woman passed by her and said, "You're brave for doing what you did." When asked by NBC News how she would vote in November, however, the woman responded: "I'm still supporting Trump, but it's not good what he said." Byrne said she is active on the Democrats' state central committee in Carson City. "The most painful thing that could happen is losing a child, and offending someone who has gone through that is the lowest of the lows," Byrne told NBC News. Later Monday night, speaking to Lawrence O'Donnell on MSNBC, Byrne said, "I knew that it was going to take bravery to mention Mr. Khan's name in that audience, I was ready and I was there for a while, but it was my opportunity to ask the candidates candid questions that are important to me."